FORT SMITH (KFSM) - Only six teams in the state of Arkansas have their season end in a celebration. Northside was not among the state champions in 2017 but the Grizzlies took a big step in the right direction. "To finish what we started last year, where we couldn’t really do all year long and put a little emphasis on what we had going on at the end of the season, to start it again, oh yeah, we’re ready," Northside senior Greg Washington said. The Grizzlies took down rival Southside in the final week of the regular season to punch their ticket to the playoffs. Northside then followed that up with a convincing win over preseason 7A favorite Har-Ber in the opening round of the postseason. "It all started coming off that Southside win," Northside senior Stevie Young said. "We had learned how to play as a team, play as a whole. So when we had played Har-Ber, not likely to even beat them and not even be favored to make it to state, I mean beating Har-Ber had boosted everybody up." 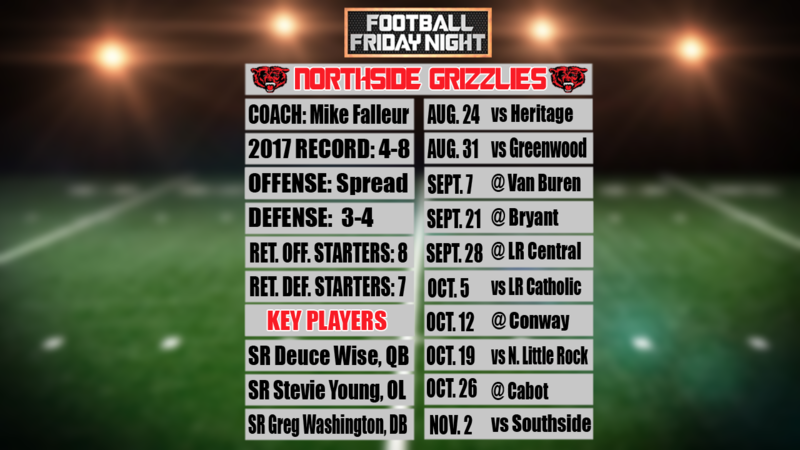 That win was Northside's first postseason victory in three seasons and it was that game that the Grizzlies are using as fuel for 2018. "The thing was, nobody thought we were going to win it so us winning that just gave it all. It definitely does give us momentum coming into this season because teams definitely know who we are," Washington said. Northside returns 15 starters, eight on the offensive side, including Deuce Wise at quarterback after he accounted for 2,300 yards of total offense a season ago. "You have to defend all eleven people on the field," Northside coach Mike Falleur said. "You can’t just guard him. He’s not going to run the football because first and foremost, that’s what we want him to do." Northside kicks off the season on Aug. 24 as they host Heritage.